The FGF celebrates its 30th anniversary in 2017. Today, the FGF is the leading academic association about entrepreneurship, innovation and SMEs in the DACH-region. It has put entrepreneurship and innovation on the agenda of most universities. The annual G-Forum Conference, organized by the FGF, has developed into the largest conference on Entrepreneurship, Innovation and SMEs in the DACH-region. The G-Forum is the first and largest entrepreneurship and innovation conference in Germany, Austria, and Switzerland. The 21th Annual Interdisciplinary Conference on Entrepreneurship, Innovation and SMEs (G-Forum) will be held in Wuppertal at the „Historische Stadthalle Wuppertal“ from October 5th to 6th, 2017. Lead partner is the University of Wuppertal. Congress President is Prof. Dr. Christine K. Volkmann, Chair of Entrepreneurship and Economic Development & UNESCO-Chair of Entrepreneurship and Intercultural Management. 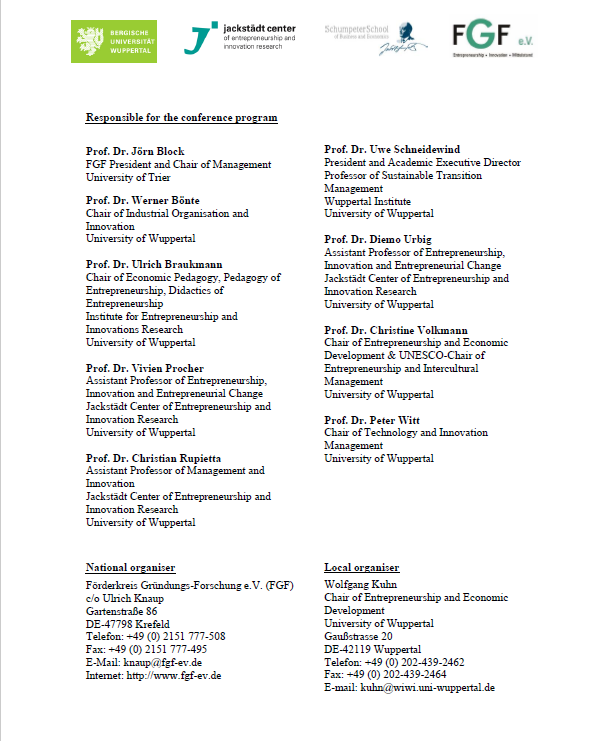 The conference program will be enriched by renowned keynote speakers. Confirmed keynote speakers are Prof. Dr. Dr. Ann-Kristin Achleitner, Professor of Entrepreneurial Finance and scientific co-director of the Center for Entrepreneurial and Financial Studies at TUM School of Management, Technical University of Munich, Prof. David B. Audretsch, Ph.D., Distinguished Professor and Ameritech Chair of Economic Development, Director at the Institute for Development Strategies, School of Public and Environmental Affairs, Indiana University Bloomington, Prof. Dr. Andreas Pinkwart (Plenum at 06.10. ), Minister of Economic Affairs, Innovation, Digitization an Energy of the State of North-Rhine Westphalia as well as Prof. Simon C. Parker, Ph.D., Professor of Entrepreneurship and Director of the Entrepreneurship Cross Enterprise Centre at the Ivey Business School, London, Ontario, Canada, as well as Dr. Monika Herzig, Ph.D., Senior Lecturer at the School of Public and Environmental Affairs, Indiana University Bloomington. For decades, economic development and environmental protection have been viewed as a zero-sum game of social wealth (Cohen & Winn 2004). Recently, sustainable entrepreneurship has gained prominence as entrepreneurs increasingly place sustainability rather than profitability at the core of their business models. Sustainable entrepreneurship is primarily concerned with economic, social and environmental consequences, thereby creating a win-win situation for the economic development and environmental protection. Nevertheless, the research field of sustainable entrepreneurship is still in its infancy. A lack of research can be observed in particular with regard to the contextual factors of sustainable entrepreneurship (Acs, Autio & Szerb 2014). In this context an entrepreneurial ecosystem can be defined as “a dynamic community of interdependent actors (entrepreneurs, suppliers, buyers, governments etc.) and system-level institutional, informational and socioeconomic contexts” (Audretsch & Belitski 2016). Entrepreneurial ecosystems play an important role for the foundation and growth of enterprises (Isenberg 2010). However, little is known about how ecosystems have to be composed in order to benefit sustainable, entrepreneurial activities. Several interesting questions can be derived: How do stakeholders facilitate the development of sustainable enterprises? How are ecological, economic and social aspects connected in entrepreneurial activities? How does the digitalization influence the development of sustainable entrepreneurial ecosystems? What role does financing play for the creation of sustainable ecosystems? How does sustainable entrepreneurship influence firm performance? Findings in form of empirical and theoretical contributions regarding these and other questions in the context of “sustainable entrepreneurship” are not only relevant for the academic field of entrepreneurship but also for management practice. Please also note our information in the FGF-Newsletter.